The results of a major federal longitudinal study that began in 2009 are in: Postsecondary education pays off in a big way for students. Inside Higher Ed has the breakdown of the High School Longitudinal Study of 2009 by the National Center for Education Statistics. The study tracks a nationally representative sample of 20,000 students who were in ninth grade in 2009 through February 2016, offering a longitudinal look at how students flow through (and out of) the American education system. Of the sample, 92 percent had received a high school diploma by February 2016. Additionally, 72 percent of the 2009 ninth graders had enrolled in some form of post-high school education by February 2016. 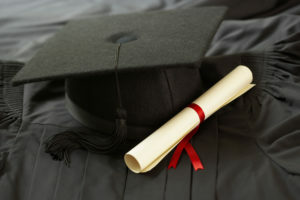 Postsecondary attendance was defined as including enrollment in an undergraduate degree or certificate program, as well as taking classes outside such a program. The study showed a strong link between privilege and education. Students who went to a private high school were much more likely to go to college. About 80 percent of private school graduates went on to college by 2016, while 48.7 percent of public school students were enrolled in postsecondary education. The study broke the students’ outcomes down by race, with clear trends (and advantages) emerging. Of the overall sample, 88.2 percent of those who identified as Asian went on to postsecondary education, compared to 75.7 percent of white ninth graders, 68 percent of Hispanic ninth graders and 64.7 percent of black ninth graders. Nearly one-quarter of the 2009 ninth graders who initially enrolled in a postsecondary degree had dropped out as of February 2016. The reasons varied: nearly half (48 percent) of respondents said they withdrew from university due to a family situation; 40 percent said they left due to financial constraints; 24 percent attributed academia and 22 percent said work stopped their education. Those who had not enrolled at all in postsecondary education offered various reasons for this decision. The most common explanations — about 80 percent — were financial or personal. Nearly one-third of respondents said work prevented them from pursuing a tertiary degree, while 9 percent cited academics as a barrier. Of the never-enrolled ninth graders, one-quarter were employed full-time, 11 percent had a part-time job, 8 percent were unemployed and another 6 percent were unemployed with no plans to find work. Nearly one-third of respondents who hadn’t pursued post-high school education said their job was closely or somewhat related to what they expected to do at age 30. Another quarter didn’t think their job resembled their expected role at all. A significant number of respondents without post-high school education reported experiencing issues to do with finances. Three-fifths of the respondents worried about having enough money for day-to-day expenses like food, clothing, housing and transportation. This concern traversed race and ethnicity. Among those without college degrees who were employed, 39 percent had an income of $10,000 or less in 2015. The bad news from the Bureau of Labor Statistics is that fewer high school graduates had opted for college as of October 2013. The good news was that more grads had jobs or were at least actively looking — but maybe that’s because they weren’t pursuing post-secondary education. Last October, just 65.9 percent of people who had graduated from high school the previous spring had enrolled in college. That was down from 66.2 percent the previous year and was the lowest figure in a decade. The high point came in 2009, when 70.1 percent of new graduates had gone on to college. At the same time, there were some encouraging signs in the report, which is released annually. The Bureau of Labor Statistics reported that 51 percent of the high school graduates who did not go on to college had jobs by October, and that 74 percent were in the labor force, meaning they either were employed or were looking for work. The figures are volatile from year to year, partly because they come from the bureau’s household survey. Another validation for the importance of the Indiana Chamber’s Indiana Vision 2025 plan and its Outstanding Talent driver.